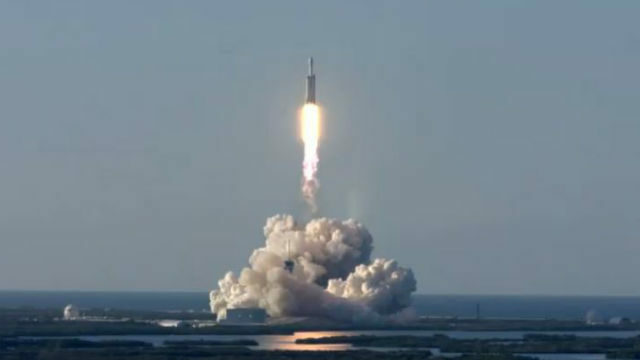 Los Angeles-based SpaceX successfully launched and landed the world’s largest rocket Thursday on the second flight of its Falcon Heavy. The giant rocket lifted off at 3:35 p.m. California time from Cape Canaveral, FL, carrying the 13,200-pound Arabsat-6A satellite, which will provide communications services to areas of Africa, Europe and the Middle East. Minutes after launch, the rocket’s two side boosters landed simultaneously at Cape Canaveral, followed by the center booster on a drone ship in the Atlantic Ocean. Recovering all three boosters was a milestone. On the Falcon Heavy’s test flight in January, the center booster crashed on landing. 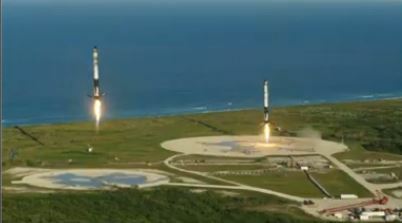 “The Falcons have landed,” Tweeted SpaceX founder Elon Musk after Thursday’s successful landings. Musk has called Falcon Heavy “the most powerful rocket in the world by a factor of two and the highest payload launch vehicle to reach orbit after the Saturn V moon rocket.” It stands 230 feet tall and is powered by 27 engines. Being able to recover most parts of the rocket has become a major competitive advantage for SpaceX, allowing it to offer considerably lower launch prices. Rockets made by the Boeing-Lockheed partnership United Launch Alliance, Europe’s Arianespace and Russia’s Roscosmos all crash in the ocean after launch and cannot be reused..